Dust off the fireworks, fire up the grill, and slice up the watermelon because the Fourth of July is right around the corner! For this Fashion Friday, we thought we'd put together a stylish holiday outfit that is just the right amount of red, white, and blue. When dressing for the occasion, you can either go the subtle route by playing up the Americana color palette, or you can go the literal route and rock a flag or anything star patterned. We like this look because we think it's the perfect mix of the two. This navy and white striped dress paired with white sneakers, a casual tote, American flag scarf and red sparkly nail polish is perfect for your picnic or fireworks gazing. 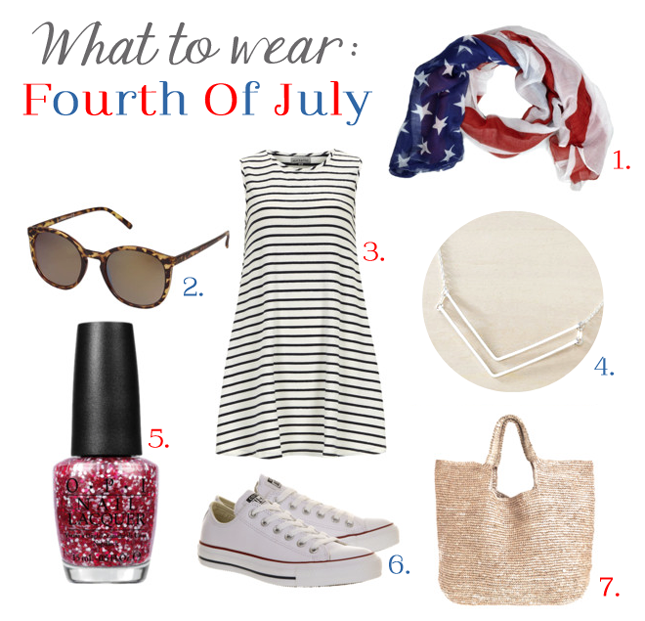 Add our Double Chevron Necklace to the mix and you're decked out (tastefully) in festive stars and stripes.